Skimmers like the A-Whale are not very effective on oil that has been in salt water for a while. They would have been valuable early on, like when the Netherlands offered the USA use of 4 skimmer ships, BUT THE EPA and Obowma turned them down. Now that the main lot of floating oil has aged, they are not nearly as useful. One of the more useful advantages of collecting the oil well blowout oil early and close to the well. Like Obowma says, from day one, not like Obowma does, which is nothing but talk. And doesn't he talk pretty? Since the President has seen fit to not bother with early oil recovery at the blown well site, it has become necessary to deal with the oil after it has formed sticky gooey tar balls, that orange stiff stuff seen floating in several news video -- oil that has been abused by the Gulf waters, gunk in other words. Many have been trying to figure how to scoop the gooey gunk up, one may have succeeded. The latest weapon in the oil battle is being built in Bayou La Batre. 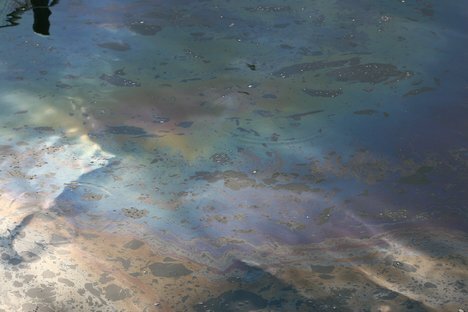 A new skimmer called a 'Heavy Oil Recovery Device' can catch tons of the heaviest crude and it may be the most effective system yet. It's a simple design. Essentially, a hollow aluminum cage lined with a nylon bag, but inventor Gerry Matherne is very confident in it's abilities. "This works," Matherne said. "This is 100 percent effective. If the oil is in sight of this unit, it's mine. It belongs to me." Matherne says from the first test they've been very successful. "Each bag can hold two tons," explained Matherne. 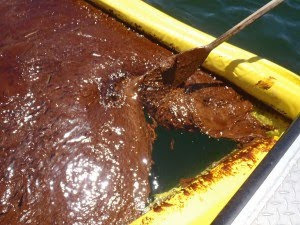 Matherne says those bags are the key to collecting the weathered, gooey oil impacting our shores, which is too heavy for other skimming devices. The bags are a lot like the leaf catcher you put on the back of your lawn mower. The heavy oil and debris will go in and when they fill-up they will be removed and replaced with new ones. Best of all, the system of collection bags can be used close to beaches, and towed by shrimp boats. Shrimpers have little to do, so it gives them jobs at least. Here is what the gooey stuff looks like in a collection boom. Oil skimmers are remediation devices used to remove oil from the surface of water,solvents, cleaning solutions,and other fluids.Our Range of Oil Recovery Skimmers are selective oil skimmers designed to remove oil spills from water. These oil skimmers are available in a range of sizes and in pneumatic or hydraulic drive for oil spill response or industrial use.